Manage your current subscription here. Cotton growers are dodging showers across parts of the Panhandle and South Plains as they rush to get irrigated fields planted. Cool temps in the 60s and low 70s are anticipated for Thursday (5/11), and could impact planting conditions. Early herbicide management continues to be a hot topic, especially the use of timely pre- and post-emergence applications. Tyler Mays, Texas Agrilife IPM agent, breaks down the flag identification colors for the different technologies. Resistant pigweed in south Texas has grower attention as glyphosate applications fail. Fleahoppers are on the radar in the Upper Gulf Coast and south Texas, where many plants are squaring. Aphids are also apparent. Thrips pressure has eased farther south, but still in the picture for central Texas. Wireworms are a worry in sandy soils recently planted in small grains. A surprisingly early bollworm egg lay in coastal fields could predict later problems. Oklahoma planting is off and running, and Kansas could see planters in the field any day. Southern New Mexico needs a rain. Arizona growers hope rain moves in from California. Scroll down to our News Links from AgFax.com, plus event announcements. 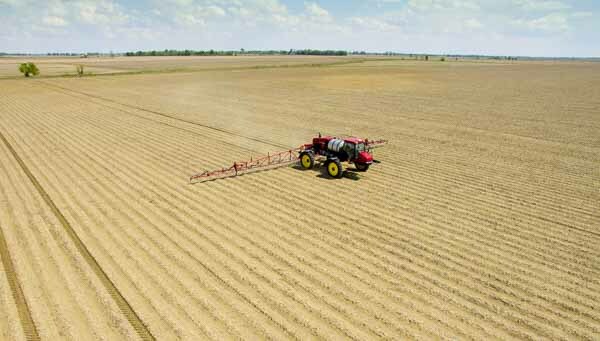 We're always expanding our list of crop consultants, dealer personnel and Extension advisors who provide the reports for AgFax Southwest Cotton. If you would like to join our contact list, just email me at: beef2lar@suddenlink.net or call me, Larry Stalcup, at 806-671-1446. Wayne Keeling, Texas A&M AgriLife Extension Weed Specialist, Lubbock: “It has been cool and planting is slow. But if we get rains in the next few days along with the forecast for a warm up, a lot of ground will be planted later in the week. “Everyone is talking about the new herbicide technologies, and we see how they can help our weed control program. But growers shouldn’t depend on them alone. Use them with residual herbicides to help keep fields clean. John Idowu, New Mexico State University Extension Cotton Specialist, Las Cruces: “In southern New Mexico, most cotton was planted 2 to 3 weeks ago. Some plants are already out of the ground. Cool nights were a struggle early, but temperatures have warmed up. However, in the eastern part of the state, cool nights remain an issue for early planted cotton and some farmers are still waiting to get into the field. There are no disease or insects to report thus far. Seth Byrd, Texas A&M AgriLife Extension Cotton Specialist, Lubbock: “A lot of guys are waiting to see what happens mid-week before they start planting. There’s still a chance of rain. The folks who started planting last week most likely have a lot of ground to cover. They’re having to balance between getting some fields planted too early and some too late. “For farmers who are more selective, especially on dryland, they may be waiting to see what the potential for rain brings. You can’t put a value on planting into moisture, but you don’t want to chase it down too deep. “Herbicide management at pre-plant and after planting remains critical. The new chemistries are not silver bullets. They are not like Roundup was early on. Dicamba and 2,4-D have been used 50 years or longer and can certainly be good tools within our weed management programs. We just have to start clean with the use of yellow and residual herbicides. You can’t miss part of the weed management system. The new chemistries are an improvement to the system, but that doesn’t change the objective of an overall herbicide program. Rex Brandon, Crop Production Services, Dumas, Texas: “We have excellent moisture and warmer temperatures, so some guys started planting Saturday (5/6) and have been in the field ever since. At the 2-inch depth soil temps are 60 degrees. But the forecast for rain and cooler weather has scared a few people off for a few days. Stu Duncan, Kansas State University Crops & Soils Specialist, Manhattan: “We may have some guys try to sneak in some cotton this week, even though we could see some rain. Those with fields under irrigation will plant early and water it up if needed, but most don’t want to start until mid-May. With our increase in acres, we may see more cotton planted earlier. “The new Enlist Duo varieties have really been popular considering the drift problems we’ve had with 2,4-D. The further east you go, you’ll see more Xtendflex with dicamba technology sneaking in where they’re planting soybeans. The new technologies make it essential that we have good communications with neighbors as to which of these new chemistries are being used. Jason Woodward, Texas A&M AgriLife Extension Plant Pathologist (Cotton & Peanuts), Lubbock: “With cool and potentially damp conditions at planting time, growers need to watch for seedling diseases, particularly rhizoctonia and pythium. Soil temperatures are still not ideal for planting, but guys have to go. If they have to irrigate the crop up, it could increase the risk of seedling disease. Randy Boman, Oklahoma State University Cotton Research Director, Cotton Extension Program Leader, Altus: “We’re planting up a storm. I’m in a tractor cab this morning (5/9) planting south of Altus. We’re looking pretty good and some irrigated guys have half their crop already planted. We have a good situation, even though there is a strong chance of storms that could slow us down. “Dryland growers will likely hold off, especially if they also have irrigated fields. We typically plant a lot of dryland toward the end of May. There are still a lot of options for planting no-till into wheat. Due to low wheat prices and cattle graze-out, there are a lot of terminated wheat fields in the southwestern corner of the state. Tyler Mays, Texas A&M AgriLife IPM Agent, Terry, Yoakum and Gaines Counties: “A few people are planting now but a lot more are waiting to see if this low pressure system brings rainfall later this week. Fields are looking good and clean. Guys have done a good job of early season weed control. “I think our flag technology is working well to identify the types of herbicide technology being used in separate fields. Xtendflex flags are black and white checkerboard. Enlist flags are teal with white vertical stripes. Other flags include green for glufosinate, white for glyphosate and red for conventional cotton and sensitive crops such as grapes. The potential for herbicide drift into regional grape fields is a concern. Randy Norton, University of Arizona Extension Cotton Specialist, Safford: “They’re predicting a 40% chance of rain on Wednesday. It probably won’t amount to much, but we’ll take it. Most of the cotton is in and up. Things will cool down this week but not enough to hurt plants. We’ll be back into the 90s later in the week. “I’m still not aware of any issues with thrips or other insects. I’ve talked with several consultants and things remain quiet. Mike McHugh, Southwest Texas Ag Consultants, Uvalde, Texas: “We’re running a little late in parts of south Texas. It was too wet early on. We’re dry now with lots of wind. We’ve had a few fields blown out and that’s forcing some farmers to replant. “Cotton that wasn’t blown out looks good. The majority is at the 2-leaf stage. We had thrips move in from wheat fields last week. They’re on the downswing now, but we’re seeing a strong outbreak of fleahoppers in older fields. We’re monitoring that closely. “Resistant pigweed is really giving some farmers problems. Some guys have made 3 applications of Roundup and there is still pigweed. Resistance is showing up everywhere. A lot of guys are trying new dicamba varieties to see if that technology fits into their cotton program. Clyde Crumley, Crumley Agricultural Consulting, El Campo, Texas: “Weather has been our biggest problem. Early rain slowed planting, but it set us up for a decent crop. About two-thirds of fields are squaring. Overall the crop ranges from just emerging to match-head square. However, dry weather the past 2 weeks and high wind have hurt some plants. Despite that, we have a good fruit set. “With the squaring comes fleahoppers. We’re seeing good success with insecticide treatments and we’re knocking them back. There are also a few aphids, hit or miss. If we play our chemistries right, we can take out fleahoppers and aphids at the same time. We’ve also seen something out of the ordinary. We had a bollworm egg lay 2 weeks ago, which is very early. They didn’t develop, but could see a worm outbreak later on. “We’ve dealt with weeds from the beginning. Many guys did a good job with their pres, but we’re still seeing weed problems. That’s partially due to limitations on spraying caused by high winds. I’m seeing good results from the new herbicide chemistries. The new products are living up to how they were advertised. Gaylon Morgan, Texas A&M AgriLife State Cotton Specialist, College Station: “We’ve turned off fairly dry in the southern Blacklands. Some guys with irrigation are already watering in the Brazos Bottom. Overall, the crop looks good. Early season stress may actually be good for these plants. It can help get them acclimated and put down a good root system for the remainder of the year. “Earlier planted cotton is approaching the fleahopper stage, but I haven’t heard of any major pressure. With cotton really emerging in the Blacklands, growers need to look closely for thrips, even though thrips pressure has been low so far.